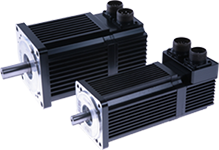 Elwood High Performance Motors designs and manufactures rugged stepper and servo motors for harsh and/or specialty environments. Servicing the unique needs of the machine tool, automotive, packaging, food preparation, and varous other industry sectors for the past 45 years has taught us a few things about building motors that survive extreme operating conditions. Whether your needs involve extreme temperatures, high pressure jets of water, sanitation regulation, caustic chemicals or explosive atmospheres, let Elwood High Performance Motors solve your next extreme motor challenge. Founded in 1959, Gettys Manufacturing (as Elwood's Motors group was originally know) has been designing and manufacturing high performance industrial motion control equipment for more than 40 years. Products manufactured in our 80,000 Sq. Ft. facility in Racine, Wisconsin, are satisfying customers throughout the world, including North and South America, Europe, Asia and India. Over time, original Gettys products have been sold under numerous different company and brand names including: Gettys, Gould, Modicon, AEG, API, and Allen Bradley. Initial products included DC Brushed Servo Motors and Drives designed for the machine tool industry. Later, AC Brushless Servo systems were developed to meet the needs of the automotive industry. Stepper motor production was added in 1995 with the acquisition of Rapidsyn. Since acquiring Rapidsyn, emphasis has been on building high performance, ruggedized stepper and servo motors for industrial automation. We are vertically integrated, allowing us to manufacture most of our own components in-house. Vertical integration also gives us greater control over the manufacturing process and subsequent lead times. Our manufacturing process is highly flexible, allowing us to easily accommodate special requests such as custom mounting dimensions windings and connectors. In September of 2001, Gettys was acquired by the Elwood Corporation and became Elwood-High Performance Motors. Located in Oak Creek, Wisconsin; just south of Milwaukee. Elwood manufactures electrical, hydraulic, and robotic equipment for industrial applications. Elwood shares Gettys' philosophy of providing exceptional customer service, and commits to the long-term support of Gettys' significant installed base of motors and drives. Looking to the future, Elwood Motors will be leverage our heritage and experience building rugged products for the machine tool and automotive industry. We are expanding our line of explosion-proof AC Brushless Servo Motors and have developed stepper and servo motor products designed to meet the complex needs of the food and beverage industry. In addition, we are adding IP67-rated stepper motors to compliment our line of high pressure wash down servo motors. We welcome the opportunity to solve your next harsh environment or custom-modification stepper or servo motor application.